My 9-year old inspired me to share his DIY Infinity Gauntlet craft that he made out of paper and I can’t wait for you to see it and let your kids make their own. As a mom, I love crafts my boys can make with little to no help. I don’t care if they look perfect. In fact, I prefer that they don’t because it reminds me they are still my little boys no matter how big they get. Both kiddos have been drawing characters non-stop and my 3rd grader found a way to create his own infinity gauntlet made with paper, a rubber band and markers! Man I love that kid. If you have Thanos fever in your house too (yes, it’s a thing), Oscar is sharing his tips for making your own infinity gauntlet. How you get the infinity stones is between you and the MCU. I love it when my kids get creative. Oscar recently learned how to make origami paper claws and decided to turn them into his own personal Infinity Gauntlet. This craft is for kids by kids. I love that because it doesn’t have to be perfect. Your child can really do this whole craft alone safely. Feel free to use colorful paper or simply color white copy paper, which is what we did. If you ask me, a great craft is something you can make right now and doesn’t need a whole lot of planning! Fold each claw according to the video below, then color them yellow (or gold if you have it) leaving an empty circle for each infinity stone. Your child may want to color them all on or create them separately to be removed. For the gauntlet, Oscar colored another whole sheet of paper and secured it on his arm with a rubber band. So smart! 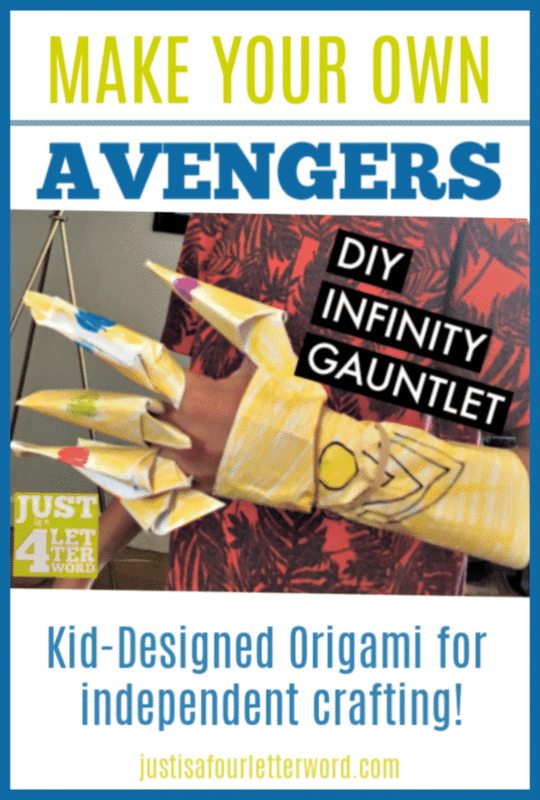 To be sure, this Infinity Gauntlet isn’t made to last, but it sure does make a great project for kids who are looking for something fun to do! We love the easy reader books for a little back story. The Jr. novels are fun too but they don’t give the whole story. Good for older kids who want a little more than picture books!